Driving with a lack of sleep mimics certain levels of blood-alcohol consumption. This is the incredible conclusion declared in a recent report on drowsy driving published by the Governor's Highway Safety Association. Going without rest for 18 hours is like having a blood alcohol concentration (BAC) of 0.05%. But it gets worse from there - no sleep for 21 hours can cause a driver to act and react like someone with a BAC of 0.08% - the legal limit for driving under the influence! In fact, the National Highway Traffic Safety Administration (NHTSA) has expanded its definition of impaired driving to include drowsy along with drunk, distracted and drugged. More than 83 million Americans drive while sleep deprived every day! 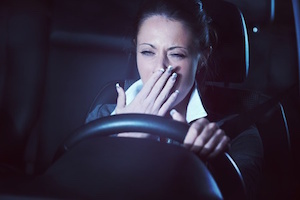 Drowsy driving is blamed for 5,000 deaths from auto accidents last year. Estimates of the number of deaths caused by drowsy driving range from 2% to 20% of all traffic fatalities. The uncertainty of this broad range results from the difficulty of recognizing drowsy driving by law enforcement as well as the reluctance of drivers to admit their condition. Drivers especially at risk for drowsy driving include overworked health care workers, such as emergency room staff. Other groups are college students, commercial vehicle operators and those with sleep disorders like sleep apnea. In Florida, the first week in September is "Drowsy Driving Prevention Week" as declared by the Florida Highway Patrol. Drowsy driving caused more than 4,000 accidents in our state last year. Don't drive at times when you normally would be asleep. Check the labels on your medications and avoid driving if they warn of drowsiness. Take a break every 2 hours on long trips. Stretch your legs with a brief walk and enjoy a cup of coffee. If you begin to feel tired while driving, don't try to beat it! Opening the window for fresh air or turning up the music won't help. Pull over and take a break, even nap briefly in a safe place. Share driving responsibilities with a passenger. Never drink and drive - even 1 drink is too much. If or a family member has been injured in a car accident or in any other personal injury, please contact the Law Offices of Diana Santa Maria, P.A. immediately. Our experienced attorneys have the right expertise to fight for the compensation you deserve. Please call us for a free consultation. Attorneys Diana Santa Maria and Laura D. Dolin, personal injury attorneys in Fort Lauderdale, will fight to secure justice for you and your family. You can reach us at (954) 434-1077 or contact us via the website.